Some time after the lingodbhava Swamiji used to blow vibhuti out of his mouth. He explained that this phenomena heals his body after he has manifested the lingams. Vibhuti also poured out of Swamiji’s skin at this time. Swamiji said that this was God’s grace manifesting through his body in a tangible form for our sakes. During vibhutibhava all the devotees were asked to sit in rows while Swamiji blessed each person, placing his hand on their heads whilst blowing vibhuti out of his mouth. He used to bless the devotees in this way for several hours. Much of the fine, extremely fragrant powder was also caught in a soft cotton bag and later on packed and sent to the Centres and devotees around the world. The greatness of vibhuti or holy ash has been well known by the followers of Sanatana Dharma for thousands of years. Vibhuti is consecrated ash used essentially by devotees of Lord Shiva. Devotees of Lord Ganesh and Lord Muruga also use vibhuti. Smearing various parts of the body with holy ash is deemed to be the highest wealth in spiritual terms. White vibhuti powder represents the final stage of everything (“from dust to dust”). It is the reality that remains when desire and ego have been burnt by the fire of illumination. It symbolizes purity and renunciation of desires. It reminds us of the temporary nature of our physical body, which will one day be burnt to ashes after death. It also reminds us of the urgency to strive earnestly to go forward on the spiritual path and come close to God in this life itself. Holy ash is regarded as a most sacred substance. It is prepared by burning cow dung along with other precious items – milk, honey and ghee to name but a few. Often, when anything is burnt, the ash is of a dark colour. However the items burnt to make vibhuti form a clean, pure, white ash. Everything given by the Divine Mother is regarded as God’s grace and blessing. The milk cow is looked on as Gomata, a divine cow mother, and her milk is considered to be precious and sanctified. Milk itself symbolizes absolute purity. Vibhuti has the capacity to retain all kinds of spiritual vibrations. It is said that the vibrations that emerge while chanting sacred mantras can be transmitted to the devotees through the means of the holy ash. Vibhuti has special cleansing and healing properties. When we apply vibhuti to our foreheads, it calms the mind. We use the first three fingers of the right hand to apply vibhuti. There are magnetic energies connected within our bodies to these three fingers. Swamiji very often gave vibhuti as a “divine medicine” for people who had various physical or mental problems. He advised them to apply a little to the forehead when sitting for meditation or prayer. 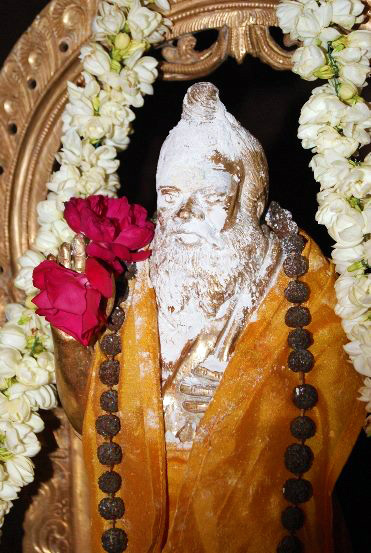 Since Swamiji’s mahasamadhi, vibhuti has appeared on several occasions both on his photo that is in the puja hall and also on the statue of him which is in the temple. This sacred and fragrant white powder has been distributed to devotees all over the world.